2 Cases (2 Blinds/case) Home Decorators Collection White 2 in. Faux Wood Blind - 23 in. W x 48 in. L (2" Slats) 10793478079186. New in Box. Embossed slats have a woodgrain appearance. fits windows: 23 in. Wide. Durable and moisture resistant. 2-1/2 in. matching valance. Ideal for bathrooms, kitchens and garages.You get 4 blinds in total. 2 Cases of Hampton Bay White 1 in. 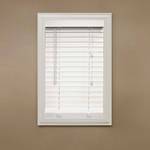 Room Darkening Aluminum Mini Blind - 30 in. W x 64 in. L, 013064472 (4 Blinds/Case) New in Box. 2 Cases of Hampton Bay White 1 in. 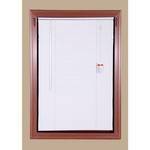 Room Darkening Aluminum Mini Blind - 30 in. W x 64 in. L, 013064472 (4 Blinds/Case) New in Box. Fits windows: 30 in. Wide. Breakaway cord. Durable and moisture resistant.